Finally we had a good day in the garden on Sunday. The grass got cut and I discouraged many of the brambles that were ensconced behind the greenhouses and threatening to entirely cover the glass as soon as the weather warmed up. 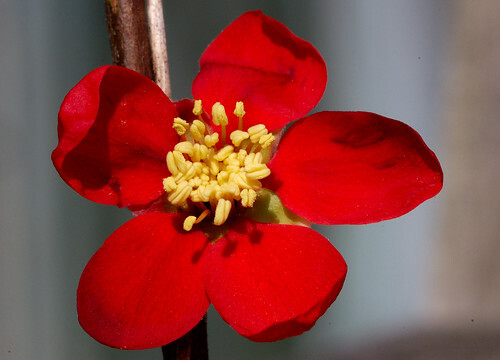 These things are tough and were even rooting in the Japanese quince debris in the gutter and snaking their way into the greenhouse by way of the glazing bars. They're not gone though, the gap between house and fence is too narrow for my womanly form and so the roots are still firmly in the ground, biding their time until my back is turned. And after that, and treating my substantial wounds gained in the pursuit of victory, I managed to plant the square metre bed with some easy plants for the summer. wild rocket, lambs lettuce, turnips. We're hoping these will be able to look after themselves to an extent because the time has come and it seems that I may finally be going back to France. I'm really not sure what to say about this - I have been waiting and wanting and hoping nearly all winter and now that it is almost with me the old panic about leaving my projects here behind is stirring. It would be so nice to put my roots down properly somewhere.